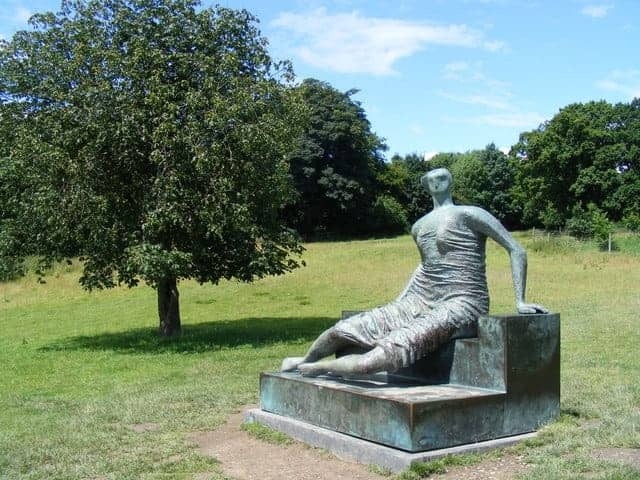 'Draped Seated Woman' is a bronze sculpture by British artist Henry Moore, one of seven castings made in the 1950s. Moore's experience as a war artist drawing people wearing thick clothes initiated his interest in drapery reinforced further by the classical sculptures that he saw in Greece. The sculpture depicts a seated female figure. The drapery emphasises her figure while her facial features are abstract. It is around 6 ft 7 in (2 metres) long, 8 ft 2 in (2.5 m) tall, and weighs 1.6 tonnes (1.6 tons). The casting now located at Cabot Square, Canary Wharf in London is nicknamed 'Old Flo'.